There’s been a lot of talk lately about ‘A-B’ marches – do they make any difference? Are they an important tactic or a useless irrelevance that’s easily ignored? Yesterday the People’s Assembly Against Austerity march attracted a quarter of a million people. A few weeks ago, the documentary We Are Many about the record breaking global day of protest against the war in Iraq hit cinemas. 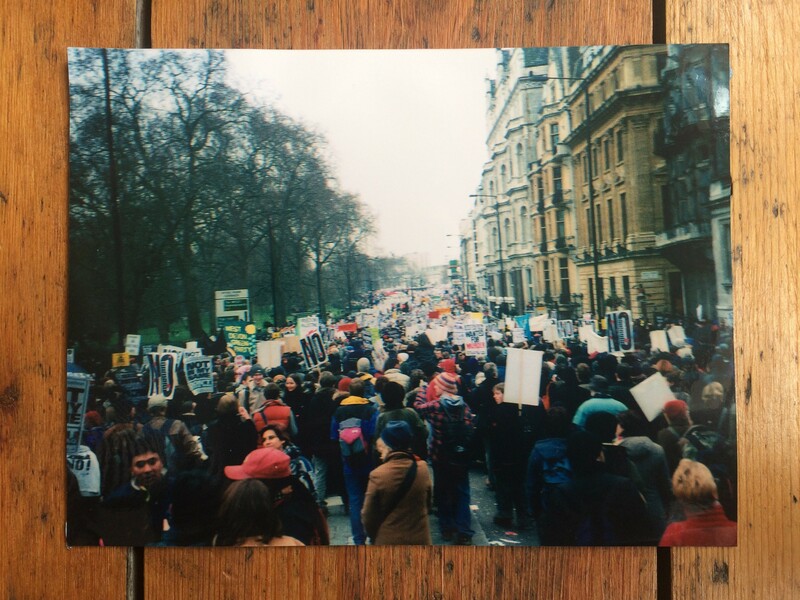 This post is going to take a little look at the history of the protest march and bring in some organising theory from the incredible Movement Mastery in the US. On February 15th 2003, over 15 million people marched against the war in Iraq in 800 cities around the world. Demonstrations were held across Europe, Asia, the Americas, Africa and even a remote research station in Antarctica joined in. I was on the demonstration in London and it was incredible. I’ve done a lot of marching in my time – one of my earliest memories is of attending a CND march with my mum as a toddler. But this march was different, it wasn’t just the usual suspects, and many were marching for the first time. There were banners saying things like ‘Winchester Rugby club against the war’ and ‘Oxford Women’s Institute against the war’. It was more of a shuffle than a march really – there were so many people, my small group only covered about half a mile in hours. But then, obviously, the decision was made to go to war anyway. Instead of this escalating the protest, and although the Stop The War coalition continued to organise, the momentum was lost, the majority gave up and felt the movement had failed. David Babbs is on record as saying this perceived failure was the impetus to found 38 Degrees. We Are Many puts a much more positive spin on the legacy of Feb 15th, arguing that it helped escalate global protests on a variety of issues, and that it has prevented western countries going to war in similar interventions (citing Syria as an example). Personally, I think asking whether or not a march is effective on it’s own is a daft question. The perceived failure of the Iraq war demonstration and the rise of clicktivism are partly to blame for this impatient approach to change. One single march for any cause, even if it’s really big, won’t ever achieve long lasting change on its own. It needs to be part of a much bigger movement, sustained over a serious period of time (sometimes we’re talking decades). And its just one of a variety of tactics that can be employed to achieve change – it needs to work with other approaches. But why didn’t the 2003 march escalate protest? Why were people so easily defeated? I attended some excellent training run by Carlos Saavedra last year which explored these questions. Carlos was a key organiser in the US DREAM movement, and subsequently founded Movement Mastery to reflect on and share his learnings from a decade of organising. Saavedra combines the organising approaches which he refers to as structure and momentum to propose a recipe for social movements to succeed. The structural organising tradition is epitomised by organisations like Citizens UK (and many NGOs). These institutions are funded, staffed and organised hierarchically. They target decision makers for incremental change, and build the power of the organisation. The momentum approach, on the other hand, is embodied by much looser movements like Occupy. These coordinate horizontally through a shared strategy with only the most basic structure, building people power through active popular support, and seeking to achieve transformation societal change through achieving symbolic victories. Successful social movements need structure and momentum combined. Indian Independence, votes for women, the abolition of slavery and many other historic victories were won when social movements managed to combine structure and momentum, building public support and escalating the cause. Saavedra talks about ‘moments of the whirlwind’ when suddenly a cause takes off and achieves mass popular support. The 2003 Iraq war march was one of these moments; the Occupy movement another. Occupy has a hugely impactful legacy, with the concept of the 99% vs the 1% commonly used and understood around the world, but it fizzled out as an active thing because it didn’t have an organisational structure to absorb support into. The Stop the War coalition did have a structure, but it was nothing like the scale needed to absorb the huge flood of support in 2003. Even if it had been ready for this truly daunting task, it would probably only have attracted support of a fraction of those who marched as Stop the War’s politics don’t appeal to everyone who opposed the war. I would say that the Iraq war was a great example of protest working although I understand why it may not look that way. If it were possible to go back and run a control experiment where there were no protests we would see that it could have been a lot worse. In cities like Fallujah where there was nothing that the invaders wanted and a lot of resistance, daisy cutters if not nukes would have been used to flatten the city without any attempt to allow civilians to escape. It is hard to look at a situation as grim as the Iraq war and the associated war crimes and genocide and say “it could have been worse”, but it could. Protest movements do not die out but merge into each other. The road-protest movement of the 1990s to a great extent merged through movements such as Reclaim the Streets into the anti-globalisation movement. Hierarchical protest groups either become part of the establishment like the Labour Movement, fall apart through infighting or die out through irrelevance. I think you’re dead right about the winning combination of informal horizontal groups and strucutred hierarchical ones. In environmental activism, the big successes I’ve seen have been the roads and GM camapigns, and to some extent the climate movement. Both had direct activists doing what they do best, not as one-offs but as a rolling campaign. This sustained activity meant the spotlight could be drawn on to the more polite world of scientists and NGOs, who got given feature-length attention rather than a blip in a news report. From there, the establishment was forced to respond and a few rebels popped their heads up in their ranks, and victories were achieved. Taking that combination as a model, the current anti-fracking movement looks more like a winner than any environmental campaign I’ve ever seen. I agree! The anti-fracking movement is looking pretty solid. Loads of radical activism, support of the big green NGOs, and money from the latter to fund the former. Not just all that, but the roads and GM movements had crucial local support from every affected place. There’s an intensity and fervour in people fighting for their locality, and a freshness in people who’ve been newly politicised, that brings real power. These people aren’t gonna back off. The anti-fracking nanas at Blackpool are the most energising political figures I’ve met in years! True – there is a lot to be said about local struggles & strength of opposition to something happening on ‘your patch’! Also, it’s a releif to read something from an activist that doesn’t see a marches/direct action dichotomy. Direct action certinaly has more impact, but it is also hard to participate in. People who have family/work commitments, fear of arrest or have other limitations that prevent them taking part are way the majority of people. As such, direct action is primarily the tool of those who are able bodied, commitment free, and very dedicated to the cause. Conversely, being on the streets in a predictable demo doesn’t take much time or risk, so many more people are prepared to do it. It shows the direct activists that they’re supported and so should carry on. It shows the wider world that there’s strong feeling, so other actions will be taken more seriously. It’s also a great exercise in preaching to the converted, which is possibly the radical activist’s most underrated activity. There’s a reason why the religions that have the majority of the world’s population as adherents spend a lot of effort literally preaching to the converted. It brings the converted in from a week of being out in the wider world, puts them among a mass who feel as they do, gives them comfort, bolsters their faith, and gives them some good topics and lines to talk about when they go back out into the world next week to convert the unconverted. I’m unsure, I think the entrenched politico’s laugh off marches, and the last real demonstration / march that actually changed anything tangible from my point of view would be the Poll Tax marches which escalated into riots after provocation. I really don’t know which what to go on this topic. My life of direct action, Hunt Sab, riots, demonstrations, marches have achieved next to nothing; and I am loathe to head towards Makhnovista / Maosist extremism… not even just to “prove a point”, as I know the media will pervert and twist and misrepresent any point of view for their own gain, as they have been doing for 40+ years. I guess I am losing faith in society to stick up for itself and those that do not have a voice; which is very sad indeed. I’m sad to hear you’re feeling so disillusioned with activism. It sounds like you’ve done so much! I’m sure it will have made an impact. But when you’re very close to something it’s hard to see what it’s achieving. Change takes a very long time, and things often get worse before they get better. I think it’s a good idea to take a break every so often to stop yourself getting burnt out & come back afresh. The most important thing is to approach activism positively – if we don’t believe we can win we’re not going to! Re: the poll tax riots, I don’t think it was just the fact that people rioted that won. It was a hugely popular mass movement of non payment, opposition and resistance. I agree marching along won’t achieve anything – we need to escalate engagement & throw the whole toolbox of tactics into the ring to start to shift the dominant ideology & the system. I’m really inspired by the 15M movement in Spain & the rise of Podemos. There’s a lot to be learnt from them & their rise to power gives me hope. Maybe things have to get worse in the UK before this kind of mass movement can emerge? You have a lot of sense in those words, and I think you’re right – I can’t see the woods for the trees as being too close to the situation. I’ll try the “take a deep breath and step back” approach for a bit and then redirect my activities with other tools at my disposal, generating activism and social engagement are always good things to get involved in.